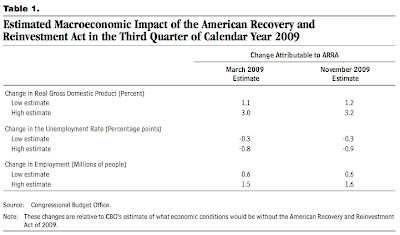 CBO estimates that in the third quarter of calendar year 2009, an additional 600,000 to 1.6 million people were employed in the United States, and real (inflation-adjusted) gross domestic product (GDP) was 1.2 percent to 3.2 percent higher, than would have been the case in the absence of ARRA (see Table1). Those ranges are intended to reflect the uncertainty of such estimates and to encompass most economists’ views on the effects of fiscal stimulus. 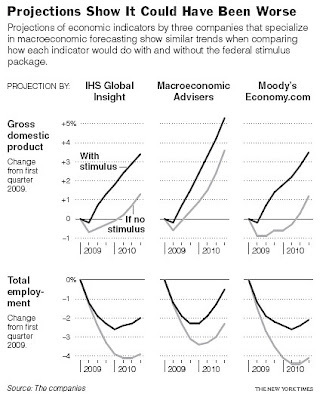 The Times quoted Mark Zandi of Moody's Economy.com as saying that without the stimulus, "G.D.P. would still be negative and unemployment would be firmly over 11 percent." "A decade late and billions short"